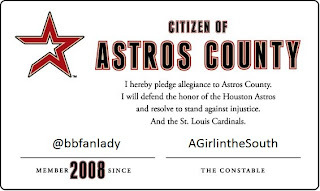 Astros County: Your Neighborhood Astros Blog & Grill: How Many People Are in this "Astros County" and Who in the World Are They? How Many People Are in this "Astros County" and Who in the World Are They? I giggle every time I think of the premise of the Astros County site. The idea that the Astros don't have enough fans to fill a nation, but rather just a county has never been more accurate than in 2013. With that thought worming its way through my head I started to wonder about who these fans were living in my county. So it's time, Astros fans, to get to know your neighbor. I'll be reaching out to an Astros fan each week to see what it is about this team and these people that keep us coming back year after year no matter what the team's record is or who is on the field. I'll ask each fan the same 9 questions (9 - get it?) and we'll see how varied the answers are. I'm looking forward to getting to know the fans and I hope you find this interesting as well. If you want to play along, shoot me an email with your answers and maybe you'll be the next part of Astros County to share your fan history. First up - @bbfanlady (she prefers we use her twitter name to protect the innocent). I can tell you this about her - she knows her stuff. A lifelong baseball fan, @bbfanlady has a great perspective on players, plays and like me, she's a fan of high socks. 1. When did you become an Astros fan? 1999. I listened to them on the radio with my grandfather back when they were the Colt 45s, but they were my big brother's "team" so in true sibling rivalry, I had to like another team, the Dodgers, because of Sandy Koufax and Jim Lefebvre. 2. What part of the country do you hail from currently? 3. Who is your all-time favorite Astros player? 4. Crunchy or smooth peanut butter? 5. Who is your favorite current Astros player and why? Jarred Cosart. (Thank you Jeff Luhnow for calling him up in time for me to answer this question.) He has great stuff, love his intensity, and from what I hear from people who really know him, he is a good person off the field. 6. If you could have any role within the Astros organization (on field or front office) what would it be? When Roger Clemens put on his cleats in extra innings of "the game" and told his Skipper, Garner, that he would give him everything he had left. It gave me goosebumps. I would not have been at all surprised if it had been Clemens instead of Burke that hit the game winning HR. Yes- broke down and got it on one TV because I was tired of watching on mlb.tv on my iPhone. Never figured out why I wasn't blacked out on iPhone, but was on iPad and computer. Guess they figured anybody desperate enough to watch on such a small screen, it was ok. But, kept my DirectTV and adding tv was basically free since I already had Internet/phone. I don't watch Comcast except for Astros games. 9. What year will the Astros once again be a contender? 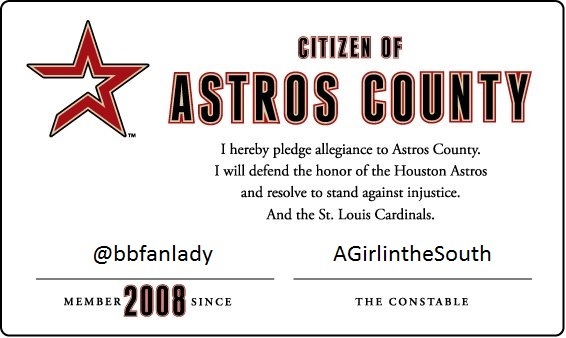 Many thanks to @bbfanlady for sharing a little bit about her Astros fandom...and peanut butter preferences. Given her answer to #4, I would agree; she definitely knows her stuff. > 1. When did you become an Astros fan? > Opening Day, April 10, 1962. Colt Stadium. Colt 45s whipped the Cubs 11-2. I worked the stands selling ice cream. It's been a helluva 51-year ride! >2. What part of the country do you hail from currently? > 3. Who is your all-time favorite Astros player? > 4. Crunchy or smooth peanut butter? > 5. Who is your favorite current Astros player and why? > 6. If you could have any role within the Astros organization (on field or front office) what would it be? > 7. Best Astros memory? > Has to be our only World Series appearance although being swept by White Sox still stings...a close 2nd is that 1st game in 1962 when major league baseball finally came to Houston after all those years as a Cardinal's farm team. > 9. What year will the Astros once again be a contender? I never realized Astros County was a joke based on the "Team X Nation" you always hear, but I love it! 1994. I grew up in Austin, and would watch the Astros while they were on TV. Bags knocking the cover off the ball fascinated me...until the broken hand happened. North Texas. Where the Arlington Rangers are currently located. Tough one. I'll go with Biggio even though I used to mimic Billy Wagner's side arm slinging. If only I could throw 100 mph when I used that method. Crunchy when eating it by itself. Smooth on a sandwich. Altuve. Born and bred Astros...can't beat that. And the hustle doesn't hurt either. The feeling of glee when I saw we had traded for Randy Johnson. If only I had known we wouldn't sign him, the players that were traded for him would become stars, and we wouldn't do a thing in the playoffs. Not only do I not get CSN Houston. I am handcuffed by blackout restrictions. Thanks Bud Selig, you screwed us again! 2014. Won't be competing for a world title, but I think we're on the verge of turning this around. To be honest, I want to be the train "engineer". we all want to be GM, and Bullpen Catcher would be fun, but the Engineer looks like he's having a blast every game.